Spicy, ripe pomogrante red fruit aromatics and baking spices in the nose. On the palate the spices, tart red fruit and a hint of vanilla persist along with with notes of berries, plums and cherries. It is balanced with excellent acidity and structure. This vintage is bright, well structured and full bodied throughout to a long complex finish. A perennial favorite. Each lot was punched cap fermented on its own in one ton or less batches and aged 39 months in French and Eastern European Oak barrels prior to blending a month before bottling. It is a Super Tuscan blend but made more like a Brunello. Each vintage of this wine has been a multiple Gold Medal winner. 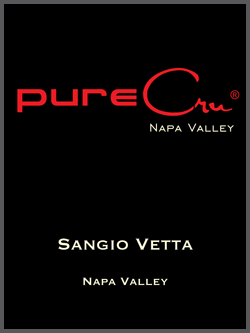 It is a small production lot that we have proprietized with the identity of Sangio Vetta, meaning Sangiovese at the peak or pinnacle. Now and in the future, it will be blended in a way that best reflects the style I believe shows it as a world class Red of unique dimension without worrying about the percentages of varietals used meeting any minimum for labeling regulations.